Hi guys, I will upload a schematic and pcb layout from a traced Chandler Tube Driver soon. How do these differ from the Paul C "Mini Boogee" pedal? Looks like this unit works with bipolar low voltage supply as the Tube Driver that were constructed after this line of pedals. 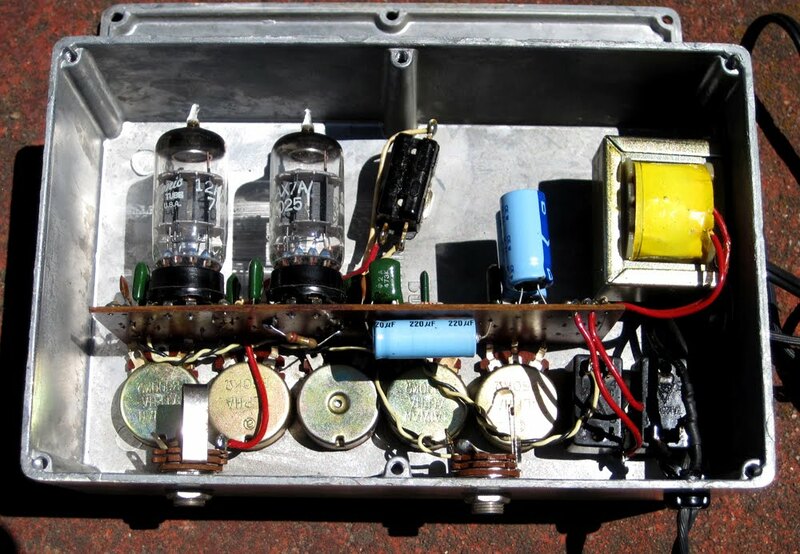 Will be interesting to trace one of this units due I cant´t see any transistor or op amps (at least in the first photograph), and all the amplification looks to be done with tubes. Any forum member has acces to one of these oldies ?? Thank you for the schematic you posted...!!!!!!! Can you post the link of the thread where this diagram was found, in order to read the opinions about this pedal ?? As promised here is the schematic of the early tube driver traced from the guts posted on this thread. ---> R14: On the new RI version it increased from 2,2k to 22k. Several people reported that the tone stack reacted different on the new version vs. the old one. This value change is the reason. Maybe 2,2k works better when one rolls off both the Bass and High a la Eric Johnson?? ---> R7,R8: From the pictures the plate resistors look like 6,8k. I was expecting 47k here. Was this unit moded for lower gain tubes? "Tube Driver" can you please measure the bias voltage in both R7 and R8? ---> R12: increased from 10k to 22k in the new RI Edition. This gives more gain/less headroom. ---> C3: Was not identified on the guts pictures. I'm guessing its value is 120pf. "Tuberiver" can you confirm this? The new RI version is better than the old one regarding PWR Supply, noise etc.. But i would maybe change R14 and R12 to the old values and listen what happens. If anyone there has one of this early tube drivers please post the guts. I want to check the values of R7, R8, R12, R14, C3 on other units. With the files that i attach here is very easy to find the components on the PCB. Forgot to mention before, if you have a Chandler Wall Mart Tube driver you can easily convert it to a "authentic" tube driver by rebuilding the tone stack section. On the post above of course i was refering to the 4 Knob Chandler Tube Driver with Wall Mart. MWichni wrote: Hi guys, I will upload a schematic and pcb layout from a traced Chandler Tube Driver soon. Hi! Do you have the guts of that Chandler Tube Driver? Can you post them? I try to post something during this weekend. Sorry for the delay but I don't have much time at the moment. Thanks for your kind words. Aron has a schem for the early BK circuit I believe. That's what I based my Pentode Driver on. If someone can please verify it. I built one but I don't remember which pcb file was the final one. MWichni wrote: If someone can please verify it. I built one but I don't remember which pcb file was the final one. I'll check if it was this pcb file that I used for etching my tube driver. I once owned one of these and sold it on ebay because my rackmounted tube driver sounded better. It wasn't a bad pedal but it required very careful tube selection to sound decent. I noticed an error (really two) compared to what I had in mine- the 220k from the wiper of the treble pot to the bottom of the treble pot and the wiper of the bass pot should be wired to one end of the bass pot- I don't recall which. I meant to say the 200k is wired between the wiper lug and the bottom lug of the treble pot, changing the value of the pot as you sweep the control. ugh, how do I edit my bad posts? I keep saying it wrong! -the bass pot is wired as a variable resistor with one end tied to the middle lug so that when the control as at max, the pot is at its full value. anyone know if this thing is right?